Worthwhile Touristy and Non-Touristy Things To Do Near Downtown L.A. If you’re new to the area, then you’re really going to enjoy all of the amazing things that Los Angeles has to offer. With so much to do and see right outside your bedroom door — literally, a short walk down the street will get you to a number of noteworthy destinations — you won’t want to miss a day of this beautiful California sunshine spent indoors. Of course, given our lavish, luxury Westlake apartments here on Lake Street, you might find it difficult to break through the soft, inviting chains of indoor comfort. After all, here at 422SOUTHLAKE, we’re only here to tell you about the area — not advise you on how to live your life. That’s your parents’ job, even though you’re probably nearing your late twenties or early thirties. Alas, we digress. Like we said, a quick walk up (or down) the street gets you farther than you’d think, and a short drive (or Uber, because really, who actually drives in the city these days?) will get you to the very best spots in Los Angeles in the proverbial blink of an eye. 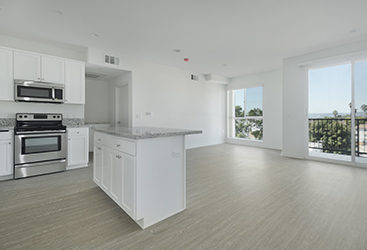 It’s all possible through our luxury apartment homes for rent near downtown Los Angeles. 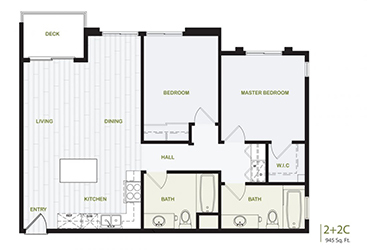 With multiple floor plans available, 422SOUTHLAKE encourages you to take advantage of our special offers today! 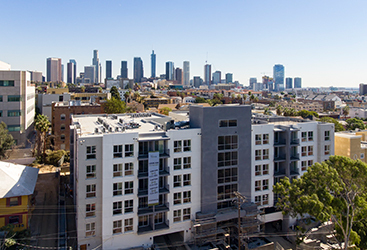 Live the Los Angeles life and experience the very best that this iconic U.S. city has to offer by contacting our apartments at 422 South Lake Street today to get started! 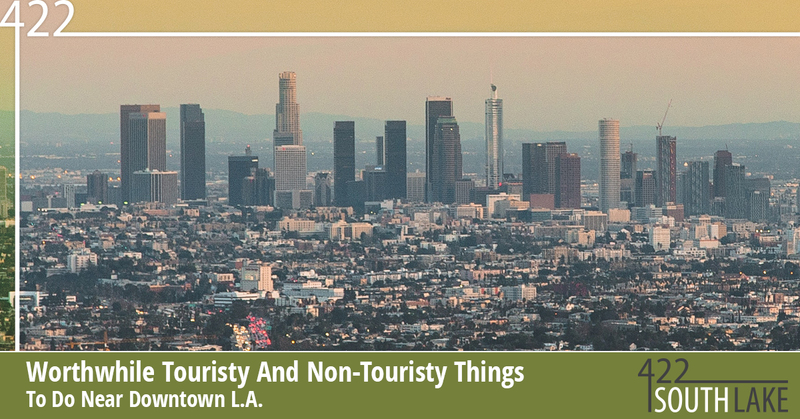 Below, we’re going to take a look at a mix of some touristy and non-touristy things to check out here in the city of angels. There are a number of routes you can take to visit the ever-iconic Hollywood sign that looms above the city in the foothills. This Southern California pilgrimage is something that draws people of all backgrounds and interests. Of course, this is possibly the most touristy hike imaginable — there are many hikes available that aren’t too far away from the city that also offer no trailhead fees and free parking. Soak up the sun and get out of the city! If you’d prefer to stay in the city, and you’re a total music junkie, Amoeba Music is the place to be. With a sheer mind-boggling number of records available to browse through and purchase, it’s easy to get lost and spend several hours here. Even the plethora of album artwork alone will have you walking around like this place is an art gallery. Perhaps this infamous yet classical musical comedy isn’t for everyone, but the Nuart Theater in Santa Monica (admittedly a bit of a drive away) offers a weekly midnight showing for you night owls out there. Many people recommend that everyone should at least experience this wild cinematic ride at least once. Located in Echo Park on Sunset Boulevard, one of (if not the most) hopping party spots on Monday nights is at The Shortstop. Perfect for all you service or restaurant workers who have the obligatory Tuesday off, this bar and venue features weekly DJs who spin some of the freshest tracks from the Motown era. If you’re feeling like dancing on a Monday night, this is the place to go! As it turns out, people do walk around this city instead of just purely driving. A well-known thing among locals but a well-kept secret from tourists, Charles Fleming’s “Secret Stairs: A Walking Guide to the Historic Staircases of Los Angeles” will take you through some of the more unique, quirky inner-workings of the city. Don’t trip! Getting out on the water at Echo Park Lake is a lovely, quaint way to observe the city skyline. Complete with a natural backdrop of greenery and palm trees to balance the concrete jungle view, Echo Park itself is just a wonderful place to spend time away from the shopping, restaurants and rampant commercialism. Pedal boating on the lake is also highly recommended. Looking For Some Hip Bars? Hit Up Highland Park! Bar-hopping with close friends is always a good time, and bar-hopping at classy, swanky establishments is even better. Take a walk or short Uber down to York and Figueroa streets on a Thursday, Friday or Saturday night and experience some of the best nightlife away from the more touristy bars of Los Angeles. Want to get one of, if not the best, view of downtown Los Angeles — for free? The observation deck on the 27th floor of City Hall will do just that. There are multiple free points in the city that offer breathing views of the architecture and surrounding landscape, but in terms of touristy things to do, this is a go-to viewing destination. Experience It All By Living at 422SOUTHLAKE! Offering an amazing location in the Westlake neighborhood at an affordable price, complete with generous amenities and incredible units, you’ll want to make 422 South Lake Street your next address! Learn more about our luxury apartment complex in Westlake and find your new home in the city by contacting 422SOUTHLAKE today. Learn More About Our Specials Here!